About Snoochie Boochies and contact us! Recently launched in London’s Soho area is a new tea and coffee revolution. Forget Seattle and its Starbucks, its all about the Far East and the rise of Bubble Tea and now for the first time in the UK, Bubble Coffee, housed by brand new franchise Chew. You can’t really miss the shop if you walk past it, its neon orange lights will be a beacon of hope for those walking the streets upon night fall, and a nightmare for anyone with a hangover! This first site has been fashioned by Afroditi Krassa, the award-winning designer who created the brand identity for Itsu and was later appointed Creative Director by founder Julian Metcalfe – who also started sandwich chain Pret a Manger. 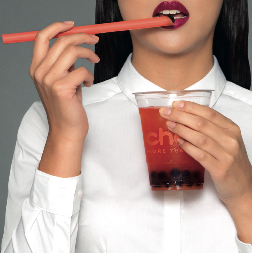 Chew is aiming to pioneer the next step in the bubble beverage evolution by kick-starting the next big drink trend. Chew, so called as it is literally the drink that you can eat, will be serving adventurous Soho residents not only a new take on freshly brewed coffee, but will also be offering over 30 fruit and milk-based bubble teas. Tea has be reimagined and given the Chew treatment. A variety of black and green flavoured teas have been ‘sexed up’ with the signature bubble tea ingredient, jelly-like tapioca balls – which are freshly prepared on site, and have the strangest, yet most addictive texture! Where did Chew come from? The Bubble Tea phenomenon originated in the streets of Taiwan in the 1980s and the trend has slowly been travelling West ever since. 30 years on the bubble tea movement is far from middle aged and in the UK it’s still in its infancy. Over the last couple of years various concepts have introduced the Far Eastern inspired refreshment to British palettes. Chews founding owners, husband and wife team Karim and Sara Hemsi first came across bubble tea in San Francisco, fell in love with the concept and then travelled to Taiwan to be trained in the art of modern tea making! How did it hit the streets of London? 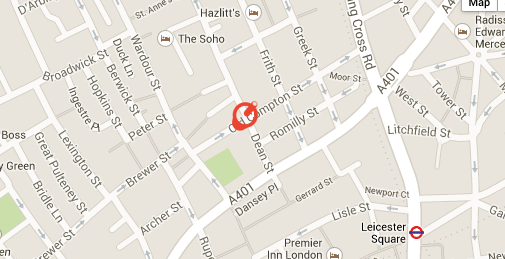 In 2011 Boba Jam in Chinatown claimed to be the first bubble tea parlour to open in Central London. 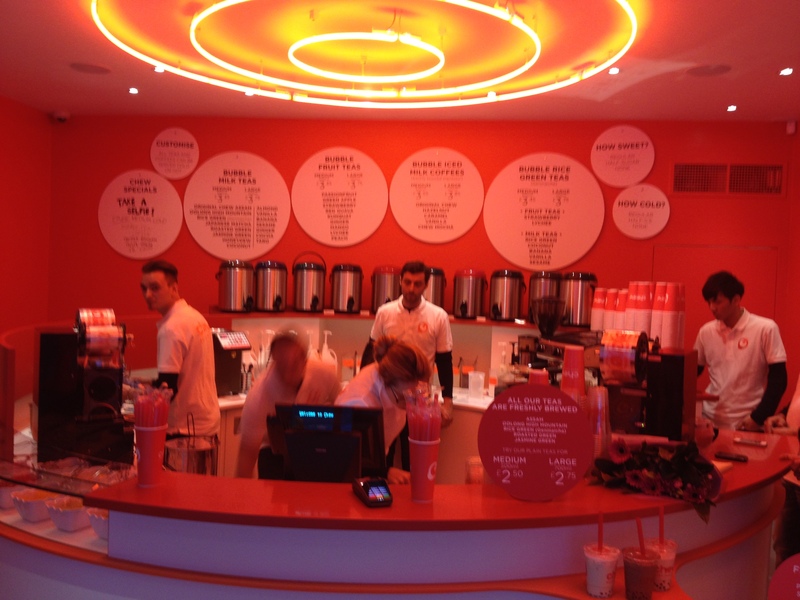 Bubbleology launched the same year and now has six outlets. Bubble tea appears to thrive where trendy young people converge however it would seem that the Chew brand aims to brew tea of the bubble variety not only for Soho hipsters, but also for the Great British tea-drinking public. So how much will this set me back? I’m sold, lets chew! 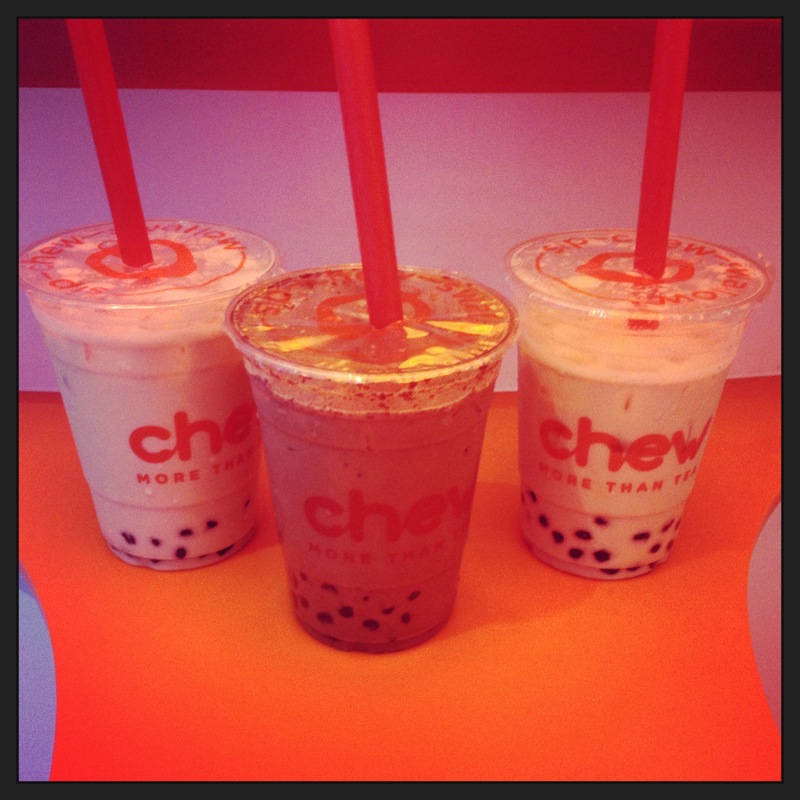 You can follow chew on Twitter @chewtea and find out much more about the company on its website! Posted by Rebecca Perfect in Calling all Snoochie Shoppers!